A Love Letter to Jason Varitek - Cursed To First - Sox and Pats forever. Last night, while Daisuke Matsuzaka “flirted with history,” I took in a fantastic concert in Cambridge, and resumed a friendship that had gone quiet the last few years over drinks and a late dinner at Asgard. We ate at an outside table, looking in at the gigantic HD screen, which by the time we got there was showing the Celtics game. It wasn’t until I came home that I saw that Daisuke Matsuzaka had sustained a no-hitter through 23 outs. I realize Daisuke was really the focus of this game, but plenty will be written about him elsewhere. And truth be told, the thought that immediately sprang to my mind when I saw the news was of Jason Varitek. At that magical field box game last month, aka Photo Heaven, I took some of my favorite shots ever of Tek, in his gear striding to the plate, back at the plate again squinting off into the distance, holding a bat, the C on his chest standing out without his chest protector on. Jason Varitek is a striking ballplayer -- physically, visually, he is everything gritty and noble and timeless about the game of baseball, embodied. The way he holds that steady gaze, the kind that would break yours easily if you ever encountered it in person. That stern expression, always determined, always professional and dignified. One of the best shots NESN ever included in one of their lead-in montages was of Varitek’s eyes gazing brightly out from behind his mask in the blazing sun of a scorching midsummer’s afternoon, a single bead of sweat cutting a path down one muddy, dusty, stubbly cheek. Or maybe that’s just a projection, and maybe the way Varitek looks to a fan is a product of the way he carries himself. Above all, Varitek is that grim, steady figure, silent most of the time, particularly on the subject of his own accomplishments. But in his newly spotty role this season, the days he does catch have made his value as a pitching coach on the field crystal clear. Daisuke’s still the one who, with apologies to the Commander, executed the pitches. This isn’t meant to take away from his performance or suggest that Varitek was the sole reason for his dominance tonight. But the correlation between our pitching staff’s best work this season and Varitek’s appearances behind the plate is strong. Thinking of Varitek in this context is bittersweet. Like Tim Wakefield, it feels now like there has never been a Red Sox without him. I’m sure there have been players that felt like that before, and of course their time to go never failed to arrive. Varitek has seen something of a recovery in his offensive production this season, but it could be his lightened playing schedule that’s accountable for his resurgence. And whatever happens this year, the fact is that Tek is not getting any younger. His starts will only grow fewer and further between. Every play of every baseball game begins with a thought – in the mind of a man hunched down at home, before he puts down a signal to the pitcher 60 feet away, a thought distilled from a vast array of subtle situational factors, which include the temperament of the person on the other end of the battery that powers the entire engine of the game. It’s easy to scoff at the idea of intangibles, but how do you analyze, quantify, or develop in future prospects the ability to know the mind of the man he’s assigned to work with, regardless of individual personality, to anticipate his thoughts, to sense his vulnerabilities, and then make judgments -- in the midst of a hundred other calculations -- accordingly? Is that a teachable skill? Or does it say something about the heart of the person in whom it seems a preternatural gift? Which is why this isn't about disparaging V-Mart, either, or suggesting that his role should -- or even could -- be reduced. 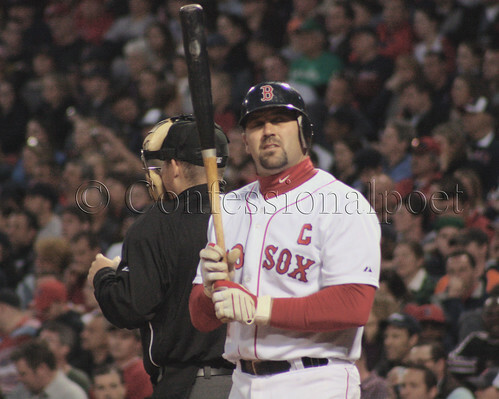 It may just be that with Varitek, we've grown accustomed to a level of brilliance that won’t soon pass this way again.